Who’s Afraid of Angels and Aliens, Alienation and Etcetera? Socially speaking, as opposed to orations in solipsism, it can be quite alienating to bring up the promises and perils of alien life, especially in the middle of a serious conversation. By aliens, I do not mean our fellow human beings who rarely ever garner the support of rabid nationalists anywhere. Imagine the late Jean Marie Le-Pen breaking a baguette with a North African immigrant, not for the sake of a photo‐shoot but out of a genuine sense of ubi caritas et amor. It is nearly impossible to persuade an increasingly hostile sub-culture to replace a pejorative term such as ‘breeding’ with a personably proper, more germane, and humane term such as ‘child-birth.’ Instead, I am referring to extra-terrestrial beings whose putative existence is debated in hushed corners for fear of social ostracism and a commensurate fear of mischief mongering. Crop circles, after all, were not created by alien spacecrafts but by nocturnal practical jokesters or bona fide experimenters in social psychology privileged with a large pot of research money to advance imaginary agendas of perceived good. The loss of face that comes with having a cherished theory falsified by a frowning fact can be disheartening to those who cultivate their religiosity around visitations by Extra-Terrestrials. Proponents of ancient astronaut theory suggest that prophetic visions, be it Ezekiel’s or those of John of Patmos, revolve around alien spacecraft. For aesthetic reasons, the angels in heaven themselves might prefer to be conceived as celestial beings blessed with warp drives and complex forms of space ships rather than be depicted as chimerical creatures who look half-bird and half-human. Humor aside, the point for those of us who believe in angels as the side kicks in God’s redemptive story is not to turn them into the focus of our faith. Thus, we can agree with the author of Hebrews that Christology is far important than angelology or to render that epistle with a modern ring, Christology is even more important than the quest for intelligent alien life. It is precarious to our faith if we think too much of angels and aliens, but it is treacherous to our imagination if we think too little of them. After allaying the fears of the alarmed, these topics can nonetheless be useful in enlarging our understanding of God’s sovereignty if approached with percipience and a gently tethered imagination. Popular culture is populated with analogies and allusions to angels, aliens and the like and there are even video-gamers who prefer alien avatars to human ones. The element of novelty or surprise at the presence of these sentient creatures in those spaces is entirely absent. It does sound a bit odd to think that we are desensitized to angels and aliens. However, in scholarly and theological communities, such topics are approached gingerly largely out of a well-calibrated fear of loss of face. This caution is commendable on one hand, but an overtly hypersensitive stifling of free-flowing conversation that can otherwise open up vistas into our understanding of cosmology or even better yet God’s grandeur is a form of gratuitous circumspection. So we must indeed speak of angels or even aliens beyond non-earthling extremophiles if we want to have a window into our own world as well. The very notion that we are sitting on a beautiful ball aka spaceship Earth that goes spinning around the sun, and the even more extraordinary fact that beyond our carbon-based chemistry we are endowed with the gift of life and the cognitive smarts to consider these mysteries is uncannily strange and mesmerizing. Now, try sharing this sentiment at least once with a friend or neighbor. If you are lucky, you might be considered cute even as the person returns to their houses, hoses, porcelain bowls and potted plants, and a million other errands to the ticks and tocks of their digital breviaries. Try sharing the same thing twice. You are indeed taking a huge risk of alienating yourself from friends, neighbors and loved ones. Even worse, peek your head outside the window of your vehicle at a busy traffic intersection just as the lights are turning green and shout aloud ‘Are we alone in this universe?’ I do not believe anybody has the courage to do that, but the awkwardness one might feel even in the realm of imagination is proportional to the awkwardness I feel while embarking upon this theme. Angels yes, aliens maybe. One can barely whiff the breeze of angels, leave alone taste the indigestible broth of alien soup. Despite the perceptive air of social awkwardness that pervades us, shall you and I slide together into the incongruous wormhole of counter-factual history? What if intelligent alien life does indeed exist elsewhere, would you lose your faith? Serious Christians laugh nervously when this topic is brought up and then dismiss its relevance for theology altogether. After all, Paul admonishes us against engaging in wild speculations; and that precautionary spirit of sanity is a good one to adhere to. Even so, there are times when the evidence of expansive span from astronomy inevitably leads one to wonder not so much about ridiculous looking little green men in tin-foil suits (wouldn’t these hyper-intelligent creatures have a more refined sense of couture after all) but about the genuine possibility of intelligent life elsewhere, somewhere beyond our majestic magnetosphere. Once in a while, it is a good thing to feel your pulse while looking at three-dimensional images of the thin blue line, that sliver of a silhouette which protects our precious planet from coronal mass-ejections and other spine-tingling scares from an otherwise life-nourishing star and the great beyond? If you remain stolid and stiff, unenthralled by the play and proscenium of cosmic theater, I do not want to be your friend even if your knowledge of astronomy exceeds mine by several orders of magnitude. The Adoration of the Shepherds. Charles Le Brun. 1689. oil on canvas. Height: 151 cm (59.4 in). Width: 213 cm (83.9 in). Louvre Museum. Painting and picture of painting in public domain. Persons of faith have always known that we are not alone. As Christians, we believe in the transcendent creator God who transcends space, time, matter and all created things and was supremely sacrificial in sending His only begotten Son to our infinitesimal dot in a vast universe. Furthermore, we also believe in angels albeit in regrettable form. I do not believe that angels are happy at how they are being portrayed in live nativity scenes, as if they are feathery creatures whose only vocation in life is to sing. They are undoubtedly better musicians than us, and we mock their motifs at our own peril. Even so, I cannot imagine that the Eternal God merely sits on His throne and vociferously demands that all of his creation; with cherubim and seraphim as dual conductors, be confined to one and only one thing alone, which is to sing. Would that not be the equivalent of going to college and realizing that the only discipline one can major in is vocal performance? And ceaseless singing as opposed to ceaseless praise (which we ought to offer to God) might be a form of divine torture even if the music is unimaginably beautiful, and this I find to be an inconceivably daft picture of heaven. Could this be one reason why some people reject the gift of Eternal Life, because somehow they were misled into believing that the company in hell is much better, even a hell on earth? Once in a while, I am tempted to believe that God despite his mastery over everything has forfeited His Sovereignty in one minor area, namely in the arena of advertising. Satan, as drawn by Gustave Doré, in John Milton’s Paradise Lost. This image is in the public domain in the United States because its copyright has expired. This applies to Australia, the European Union and those countries with a copyright term of life of the author plus 70 years. Why does Sin look so much more enticing than Holiness? Satan’s minions (by this I do not mean people) appear as if they are going to a party, dressed in gleaming apparel and blessed with looks to kill. God’s children (and by this I do mean people) appear to look like long-faced, funereal pallbearers regardless of whether or not they are blessed with charisma. The panoptic pall of somberness even in a happy-clappy evangelical church — despite being blessed with million dollar projectors, pitch-perfect acoustics (almost) and energetic and simpering twenty to thirty somethings who are more fresh-faced than rosebuds — is too palpable to ignore. Not too long ago, I used to attend a prominent church (whose name shall not be mentioned out of a deep and enduring respect for the people I met) on Sundays and right after the service was over, I exchanged pleasantries and partook of the incomparable delights of superficial speech with friends who behaved like strangers and strangers who behaved like friends, and before the full force of the benediction had set in, I surreptitiously dashed to the Art Museum like a petrified pilgrim who felt suffocated by the crowds. Even Picasso’s disturbing nudes as opposed to the pious euphemisms of Greco-Roman sculpture, an image that can still be subconsciously unsettling to my neo-Puritanical upbringing, did not ruffle my spirit as much as the lingering emptiness that should have no place on Resurrection Sundays. Of course, the fault is also mine. Yet, part of the problem lies in not knowing what Church should look like or even having a hard time picturing what true holiness should look like. An analogy is in order. Milton’s Paradise Lost is a great work of art, no; it is the greatest work in English literature. But Paradise Regained would not be missed even if it were never writ. Dante’s Inferno or even Purgatorio lends credence to the author’s singular genius for crafting Divina Commedia, but the part on Paradiso is a bit on the saccharine and schmaltz side, don’t you think? Please forgive me for my impertinence, lest I am struck down by a literary thunderclap. Even great writers and all sorts of artists have a hard time picturing what is good, true, and beautiful and letting these elements commingle in perfect harmony. Dostoevsky came close with The Idiot, but Prince Mushin is not Christ. It is true that we can have a foretaste of heaven on earth, but there is a poverty of imagination at work in describing God’s abode. One could always assert that the sacredness and stirrings of silence after all surpasses in value the wealth and weal of speech. Still I believe that the good Lord does not frown upon all our words even if they only sound like semi-articulate burps. The long and short of it, is that even if we cannot speak coherently of Heaven we can certainly attempt affirming what it must not be. Of what it is, one cannot speak; only the Spirit can whisper those mysteries. Even John of Patmos ran out of precious stones and rare earth metals to describe the beauteous sights in the world to come, while being exiled in the Aegean archipelago. And I say this, despite believing that his revelation is God-breathed. To me, Heaven will not be the by-product of combining the curse of Sisyphus with Wagner’s Ring Cycle. It will not be the curse of repetition with infinite duration, for infinite duration’s sake but rather the blessings of miscellany with infinite duration, for our good Eternal God’s sake (not a curse word, my friend) – not that God ever needed a Heaven or an Earth. Isn’t Heaven more about being with God forever and ever, rather than about our ability to sing forever and ever? Could we even dare to call something music if it never ever ceased? Would we want to listen to a piece of music non-stop even if it is hauntingly beautiful? On a lighter note, even John Cage the mad experimentalist had to stop at 4:33. The God we worship himself rested, as in the Sabbath (not that He ever needed one) and so we have to imagine that Heaven is a place where we will not be afflicted with the thrall of tedium. There will be no need for Solon or Solomon and the alliterative sounds of ‘Vanity of Vanities, Everything is Vanity’ in Heaven. There will be no divinely ordained torture chamber in Heaven and no place for Truth to be overcome by tedium. Perhaps, Heaven is more of a variety talent show ‘without a show,’ implying a lack of distinction between the performer and the audience. All of us are ‘performing’ if you like, with the gift to do many things, unlike modern-day monolithic Churches (where it is all about the Preacher or the worship team baby or a few headline grabbing ministries mandated by the Church Committee to the serene sounds of ambience music). We flourish as God is worshipped through our manifold gifts, and this ethos is quite different from the business-as-usual, omniscient ‘Pastor as CEO’ or the ubiquitous ‘Church Board as Roman Senators’ mind-set. I wonder if a similar stream could emerge while discussing scholarship, where Christian scholars are working together with people of diverse persuasions to create something more beautiful and abiding than what scholarship alone can provide. The response often is to point to a symposium or colloquium or even published monograph in the vein of manifestos, and the net-effect is similar to attending committee meetings where there are meetings to have meetings about more meetings. Click to enlarge: Sistine Chapel, diagram of the scheme of Michelangelo’s frescoes. TTaylor. 2006. (GFDL (http://www.gnu.org/copyleft/fdl.html), CC-BY-SA-3.0 (http://creativecommons.org/licenses/by-sa/3.0/) or CC-BY-SA-2.5-2.0-1.0 (http://creativecommons.org/licenses/by-sa/2.5-2.0-1.0), via Wikimedia Commons). Daniel in the Lions’ Den. Peter Paul Rubens. oil on canvas (224 × 330 cm). ca 1613-15. Museum National Gallery of Art, Washington DC. Public Domain. Younger Christian scholars have to reckon with this reality and pray for God’s direction to act according to their conscience, not unlike Daniel who was forced to spend the night in not so tender proximity with a very large lion. Perhaps, the hungry lion might fall asleep or even mew like a softer feline fellow. Not everybody has the moral fiber of Daniel; quite a few do indeed get eaten as fiber despite their paltry or fervent prayers. Even if one were to be devoured by ravenous creatures, it is good to remember that the Lord of hosts will re-embody the disembodied ghosts of fractured histories and retell those stories with redemptive panache. Pray we must, and pray we will; yet one cannot help wondering if even in this life there is hope humming elsewhere. There must be a better way where great books written by mere mortals or spirit-filled sermons from the pulpit inspires the building of cathedrals, the frescos of great paintings, priceless acts of self-abnegating charity or even greater books, life-enthralling designs, life-affirming technologies and perhaps such might be the workings of the culture of commentary at its best. Should not great ideas inspire greater ideas to follow, rather than merely manacling ourselves in sorry servitude to the soul-destroying ditties and deities of method? Sometimes we are reduced to the severely perilous act of polishing gambrels in a mansard roof that also doubles up as a decorative chapeau in the otherwise bleak chateau of careerism? Careerism has so little to do with the new Heaven and the new Earth or even the old Heaven and the old Earth. Despite its facade of sophistication and other worldly splendor, it is very much like the sinister face in The Picture of Dorian Gray that slowly grows out of its own humanity. If the meagerness of my stream of consciousness meditation is remotely true, we can at least agree that Heaven will not be a place to honor the spirit of bottom-feeding crustaceans or a boring place filled with one-dimensional people. Even the angels while offering their ceaseless praise to God are capable of doing many other things as well. They are called to live up to their angel-hood. Can they not tinker with the laws and constants of physics whenever they are pressed upon to accomplish something greater than the natural order of things? Their knowledge says King David, as evidenced from the poetic meditation in Psalm 8, is greater than what humans possess. Even a person who discounts the Supernatural can at least exercise the faculty of imagination to think of beings, on a level higher than human beings. By this I don’t mean computers or even sentient robots, but full-fledged living beings. Angels are those higher beings. This Hubble photo is of a small portion of one of the largest-seen star-birth regions in the galaxy, the Carina Nebula, http://hubble.nasa.gov/. However, that story is only partial. Our humble origins in cosmic dust does not suggest anything in the neighborhood of the fashionable pessimism that is being fostered not out of a sense of justifiable sensitivity to the problem of human misery but rather out of a sense of cosmological scale. A rock-climber recognizes that he is much smaller than the Grand Canyon, but it is a piece of asinine and over-educated silliness to value the crag over the cragsman. Even geologists, I am told, love their children more than large meteorites. Even in the material world, the argument of scale does not automatically translate into values of priority. The mass of our Sun in relation to other Super-Giants might be analogous to placing a tiny marble next to a large geodesic dome; yet our Sun is far more valuable than a super-giant placed somewhere at the edge of the Oort cloud. The Milky Way might be smaller than billions of other galaxies; does that make it any less valuable? The culture of technocracy, whose encrustations are based on scale, is a secularized form of pantheism, with a few gurus (experts) on their way to ‘nirvana’ while the rest of us are on the way to nihilism. Beyond outward resemblances, the comparison breaks down since in reality the assumptions of technocracy are a lot closer to a form of social engineering based on puerile, metaphysical nonsense. Even die-hard pantheists and sages in the Himalayas rarely made such evaluative arguments based on scale, even while they were affirming the evanescence of human existence. Merging into the godhead may eliminate one’s individuality, but yet the part has become a parcel of something bigger i.e. the godhead. Christianity affirms the individual, and makes the smaller person bigger by worshiping the greatest Person, that is God. Step outside the sphere of religion, what sort of empty-headed nonsense is it for the technocrat to say that the social network (be it the internet, a system of governance, or whatever you want to call it) is greater than persons? I made a mistake; that ideology of inhuman abstraction is indeed their religion. What must we do before the totem pole of technocracy? Will you please excuse me? I suffer from severe back-pain and simply cannot genuflect. Notwithstanding significant theological differences between Christianity and pantheism, I can admiringly admit that the old-school pantheist (and not the new-fangled technocrat) is still a great metaphysician. Buddhism for instance is even more radically pantheistic than Hinduism. With Hinduism, descriptions of Brahman (the absolute Godhead) range from the personal to the impersonal. Most philosophically minded Hindus can affirm that the whole is equal to the sum of the parts and simultaneously affirm that it is greater than the sum of the parts without any vertiginous sense of contradiction. A Buddhist will affirm the same without leaving any room for a Personal God. The theology of technocracy might also affirm the same, however both the whole (the system) and the sum of the parts (people, oh dear, this sends shudders down my spine) are replaceable and interchangeable at the will and whims of those who happen to be greasing the wheel. The highest value here is data or a type of perverse digital Confucianism that might make even the wise Confucius regret the compilation of the Analects. Statistical data-mining machines can render even our allegories into algorithms and decide who we are beforehand, without any input whatsoever from the protesting person. It is one thing to study patterns of consumption and quite another thing to treat the pattern as the person. In this brave new world where data and not even the consumer is king, a person is only a mumbling node. The problem again is not the technology surrounding the behavioral sciences, but the very Petri dish. The attitude in the physical sciences, especially in the world of astronomy strikes a more sensible pose insofar as the relationship between humans and tools are concerned. Even the most advanced telescopes are vaunted for the images of hitherto undiscovered stars, galaxies and so forth. A telescope might be a tool to kindle the scientific imagination; however no scientific biography of any eminent astronomer or cosmologist ever hinted that the study of telescopes mattered more than the astonishing insights telescope-aided observations yield for advancing our understanding of the universe. Telescopes are enormously beneficial; but the understanding they help foster is even more salubrious to the spirit of discovery. Even the lowliest of lens-polishers knows that this humble act is not about the lens or even the polish, but about the art of seeing and sensing vistas that are yet to unfold or hearing signals and pulses from distant galaxies through radio telescopes and it is precisely this understanding that should give both physicist and technician a vindicated sense of joyful pride in one’s work. The physicist and/or technician are always the subject and the telescope the object. The general sense of the behavioral sciences, on the other hand, in terms of the relationship between subject and object is mostly inverted. Method is the subject and the human becomes the object. Even the early founders of social physics (as Laplace conceived of it) or the human sciences did not propound such ludicrous intimations where the study of Man turns into the servitude of Man. Good Shepherd.Philippe de Champaigne. 17th century. Public Domain. Strange as this may sound to many reflective ears, it is not the Epicurean, the aesthete, the administrative apparatchik or even the pious and thoughtful pantheist who is gifted with a theological or philosophical basis for defending what is uniquely individual or human but the old-fashioned Christian. The Biblical story is not about the sacrifice of the One for the many, but about the sacrifice of the Son, the only One for one and all. And I do believe that this subtle distinction make sense in the light of the parable of the Lost Sheep. Ninety-nine sheep are singing sonnets to safety and security, and one sheep somehow doltishly ventured beyond the barbed wire and familial sounds of the bleating brotherhood into a dangerous place where brambles and shambles await. In corporate speak, a ninety-nine percent retention rate is considered a smashing success, or even a ‘gob-smacking’ success once the celebratory champagne and numberless forms of sense-altering libations set in. But in the Christian universe, the Creator God is grieving over the lost one. God is seen more as a parent. Even agrarian parents, who preceded the age of family planning, rarely dusted off their grief over one deceased child by simply declaring that there are a dozen more to attend to the farm. That attitude is unthinkable, which is why I think the ending in the Book of Job is not divine resolution but rather divine consolation. There is no catharsis in the Judeo-Christian view, vis-à-vis the tragicomedy of human existence. In a Christian moral universe, one might as well treat Aristotle’s Poetics as toilet paper once the scroll of desiccated pulp has run its encircling course into non-existence. Oh please hang on to your copies of the Stagyrite; there is much wisdom to be gleaned from perusing concepts such as hamartia (the New Testament Greek for sin), the dangers of hubris and the like. Insofar as catharsis is concerned, the wise philosopher is spouting poppycock, at least from a Christian point of view. There is not a cent of sanctimonious piffle about purification of emotions in the face of human tragedy, but only the promise of abiding peace by abiding in God. There are times, I am shocked into a state of nervous exhaustion when I find that the Bible, the greatest book that proclaims God’s good news can also be read as a horror story where lots and lots of people are going to end up in Hell. For the sake of winning brownie points with my intellectually inclined non-Christian friends, I even tried to explain away these difficult passages and even presumptuously suggested that God is going to give people second chances in the after life. Such a view ought to be treated as a personal preference, rather than a reflection of things to come. Over the years, I gradually learned that the Biblical story insofar as the redemption of human creation is concerned, is less a story of divine resolution but rather a story of divine consolation. It is not a Hollywood ending where the good guys win and the bad guys lose, and the audience applauds with self-righteous schadenfreude at the downfall of the villainous doomed and damned. Rather it is the story of two types of beggars. One who recognizes that they are indeed beggars and approach their Maker with open mouths in need of spiritual sustenance, a kind of nourishment that only God Almighty can provide. The other is willfully impervious to their flailing famishment and prefers the succor of inedible things, and feeds upon every fantasy except the still, small voice of God that invites them to the celestial banquet. One is made anew, and the other figuratively dies a second death in literal and eternal estrangement from the very God who made them. God rejoices over one, and grieves over the other. Good news for one, and sad news for the other. Yet, God’s love remains the same for both groups across the great dividing line. With due respect to my theological betters in the form of preachers or theological writers; I do not think that we should deceive our non-Christian friends by explaining away the off-putting aspects of scriptures. It is better to face up to the fact that the Bible is not a book of divine resolution, in the sense of a happy ending for all the townsfolk where the deus ex machina shows up and the denizens are conversing joyfully in wholesome tones and sipping their teas at the market square after virulent and acrimonious bouts of protracted bickering. It is more of a book of divine consolation, where the saved are consoled into a place of restoration and the lost are consoled into a place of resentful disillusionment, which is disillusionment in the truest sense of the term where all the illusions and altars of self-deception are laid threadbare. The Truth shall indeed set us free; and that applies to both sinners made saints and sinners who pretend to be saints. Either way, God will set us free to either be with Him or without Him. And just as we are about to get comfortable with our grasp of this picture, news from various corners propose that we are supposed to trade in our theology with God at the top and humans as his subjects to one with aliens at the top, and humans as their pets. By all means, interstellar exploration or figuring out the variations of life forms prompted by traces of amino acids on space rocks should be cheered on by even the religious, without the fear of the curse of Prometheus. Yet, on the other hand, it seems as if the mythological universe of the Greco-Romans or the Vikings is making a comeback, albeit in the language of the expanding universe and the recognition that our green earth is tinier than a drop in a vast ocean of the universe or multiverse. Should Christians fear this new development, where the new sciences are in spirit less and less aligned with the personal God of the Hebrew Bible and the New Testament and more and more with the mythopoeia of pantheism or in radical cases polytheism as well? Let me clarify, lest I am misunderstood. I mean this in spirit, and not in deed, for there is no excuse for me to make a false claim that all astronomers and cosmologists believe in aliens. Nor, do all of them necessarily believe in the spirits of animism that infuses the theology of polytheism; and with the progress of philosophical thinking, polytheism yields to a much more philosophically advanced and nuanced pantheism. Albert Einstein during a lecture in Vienna in 1921. Ferdinand Schmutzer. Public Domain. The ‘God’ of Einstein was the ‘God’ of Spinoza, and not the God of Abraham, Isaac and Jacob despite their Jewish heritage. It was a form of scientific pantheism interchangeable with order in the universe. So when Einstein argued that ‘God does not play dice;’ he was referring to the Laws of Physics and not to Yahweh. Frequent forays by eminent quantum physicists into Eastern Metaphysics, also suggests a tectonic epistemological shift that is moving away from a scientific view of the world informed by Christianity into a view of the world more akin to Buddhist or Hindu sympathies. This is not to say that the modern scientific worldview is interchangeable with Buddhist or Hindu epistemology; but rather to signify a shift in consciousness away from the created order of things to the natural order of things. Modern Science, at least in its infancy in the Western world, thought of God as the efficient and final cause even while they fearlessly investigated material and formal causes. Barring the exception of Jewish and Christian scientists, this view is no longer a given in the scientific establishment. Quite frequently, methodological naturalism is confounded with philosophical naturalism, and this blurring sits quite well with much of Eastern thought or even early Greco-Roman philosophy as well. The ‘gods’ of Greco-Roman thought are very much ‘gods’ of this world – Zeus was domiciled in Mt. Olympus, whereas Yahweh never treated Mt. Sinai as his primary residence, although He welcomed Moses there. Yahweh made it very clear to his followers that he was not to be confused with anything in this world; and that was the moral behind not making graven images. Creation of Man. Sistine Chapel. Michelangelo Buonarroti. 1508-1512. Fresco. Public domain. Yahweh is the Creator God and the distinction between the Creator and the Created is beyond any metaphor that we can humanly conceive. The modern scientist may not believe in Zeus or Thor, but the force fields have taken the creative place of the mythological deities. While the Christian Scientist is happy to investigate the gravitational singularity in order to understand the mysteries of the universe, the secular scientist treats the gravitational singularity with the same reverence that the religious accord to the Transcendent God. Once you throw in a narrow understanding of the Multiverse, and even the possibility of advanced aliens tinkering with our universe, modern day physics begins to re-enact Eastern philosophy, in both pantheistic and polytheistic forms, albeit with variations on the same theme. If length was not an issue, this connection can be made much more forcefully thus pooh-pooping the idea that modern science is incommensurable with ancient superstition. Again, let me emphasize – I am not describing the means as being co-terminus, but rather the spirit. Now, let us play along in the courtyard of though-experiments and inquire about the fate of Christian theology if these superior ‘demigods’ were to visit us? Would that alter the content and character of monotheism forever? If we believe that the God we worship is only the Lord over our space and time, as opposed to all space and time, then even Christians tragically fall into the error of henotheism; a sub-set of polytheism. But that is clearly not the understanding of God that the Bible puts forward – Yahweh is God over all space and time, and all creation, galaxies, the angels, and even the purported realm of the ‘demigods’ or advanced civilizations if those entities do indeed exist. For God to be God, He has to be the God of not only this world, but the God over all possible worlds. Forgive my irreverence here. Picture if only for a minute, a pedestrian who walks into the middle of a brawl and starts challenging the other fighters with the peaceful word ‘Stop.’ They disregard his presence and continue fighting. In order to distract them, the pedestrian shouts by pointing at all of them ‘Hey you, Give me your best shot.’ And all the other pugilists, gangsters, street urchins, police men and the like who are skirmishing with each other are startled and suddenly turn around in unison, visibly upset by the imperiousness of this upstart who is taunting them with ‘Give me your best shot.’ So they punch, plunge and flail, and before you could count zero, all the stalwarts are badly outsmarted and upstaged. And so the pedestrian, the last man standing, looks at all the fallen men, who are writhing in pain and remarks ‘that’s all you got.’ Now replace the pedestrian walking into the middle of the brawl with the name ‘God’ and all the other tough guys on the street as competing theories or even probable worlds, governments, principalities, aliens, human beings, the universe, multiverse and so forth. Now the picture becomes clearer. True Christianity does not claim to be the supreme street fighter (was that not the supreme mistake of Christendom?) that must beat down all the other street fighters, rather it only states that it knows the name of the Almighty God who transcends every world that is and every world that is to come, every possible world that was and every possible world that is to come, every conceivable infinity, even the infinities from Cantor’s forest of infinities – God transcends them all. Now please do not treat this metaphor to restart bloody wars of religion. True Christianity does not claim to be the truth of her own accord, but it only points us to The Person who is The Truth. For the fearful and easily alarmed, even the most advanced aliens are not angels if they are subject to the plight of mortality. Angels, even the fallen ones, are immortal according to the Biblical account. If these advanced aliens do die, as in bizarre accounts by UFO-ologists, regardless of whether or not those stories are true, we can conclude that aliens are not angels. If there are aliens incapable of death, then we are truly witnessing the angelic or demonic realm. Outside the orbit of conspiracy theories, once in a while, it is intriguing to inquire about the existence of other forms of intelligent life even as we stare into the velvety pith of twinkling diamonds overshadowed by enchanting aurorae in the oneiric skies. Yet, as Christians we should be skeptical of at least one of the versions of ancient astronaut theory which states that hyper-intelligent aliens tweaked our DNA and accelerated the process of evolution. The extreme view states that humans are mere creations of these aliens. Distant echoes of ancient Gnosticism can be found here. Better yet, our response to ‘what if they exist?’ could be ‘So What?’ Could not God govern over these non-angelic forms of intelligent life as well, no matter how advanced their civilizations are? If a time-traveler from our time were to go back to the distant pre-historic past and show them the technologies of our times, they might think that ‘we are Gods.’ And Gods, we are not. If a time-traveler from the future were to visit us and show them the technologies of their times, we might think that ‘they are Gods.’ And Gods, they are not. In principle, the same argument should apply to purportedly technologically advanced alien civilizations as well. For Gods, they are not. And we do not have to succumb to the tyranny of scale. And what if they indeed showed up, should we not as Christians show them a bit of Bedouin style hospitality. Invite them into our tents, and prepare a palatial feast where the best gourmands and chefs have a nice palate of caviar and just about every exotic delicacy for these space-travelers who warped the gravitational waves to enter into our green patch in this Milky Way. What if they violate us, and insist that we are indeed their meals to be cannibalized? I suppose the warriors among us might attempt fighting like the Will Smith character from Men in Black, the pacifists might stand in silent protest and in the end, thanks to their advanced technology, we are all going to get eaten by these chewy and gooey creatures. Even such a scenario does not alter the redemptive story or attenuate its force. Will not the good Lord resurrect us and bless us with the inalienable right to glorious bodies in the after-life? The next time when nobody is watching you, stare into the haunting expanse of space and time and inquire in the vein of a soliloquy ‘Are we alone in this vast universe?’ Even before you hear the reverberations and ricochet of your own voice or feverishly leaf through any hitchhiker’s guide to the galaxy, you know the answer lies in the resurrected Nazarene. The Last Judgement. 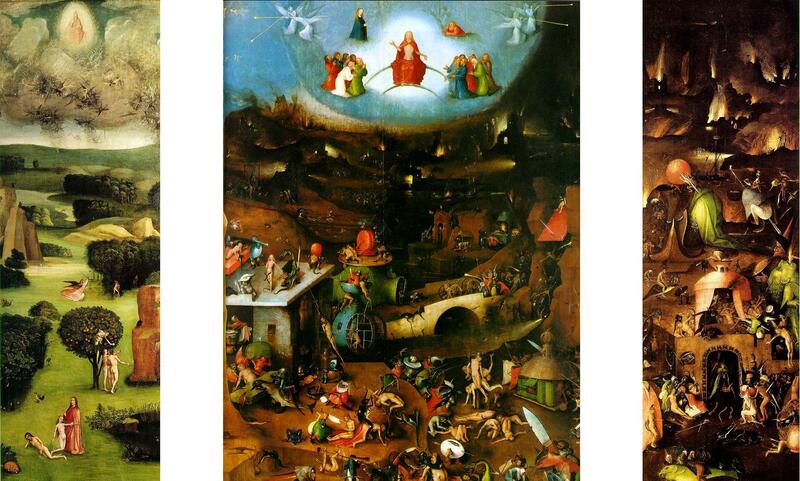 Jheronimus Bosch. ± 1482 or later. Oil on panel. 163 × 247 cm (64.2 × 97.2 in). Academy of Fine Arts Vienna. Public Domain. Roy is an independent scholar who has taught previously at academic institutions in Pittsburgh and in the Chicago land area. Currently, he is working on a project on Creation and Cosmology and is deeply interested in issues of history and philosophy of science, theological aesthetics and creative writing as well. First of all, what a meaty, far ranging post that commands more than one thoughtful read. A suggestion on the question “Are we alone?”. The Spiritual Counerfeits Project, founded by believing intellectuals in Berkeley like Brooks Alexander during the Jesus Movement of the sixties and seventies published a journal on UFO’s. The updated one is still one of their best selling pieces at scp.org. Get the older one if you can scout it out used. It would add some interesting grist to the discussion mill. I have a couple more rereads to go before I digest this post. Good stuff. Thank you. I have not read the journal. Thank you for the recommendation. This topic peeked my curiosity because of all this information about the discovery of exoplanets, super earths and the like. While professional scientists are less likely to risk their reputations in scientific journals, popular science is awash with this topic. And to a certain extent, justification for funding, can come from arguments in popular science as well. So, at some level, the arguments do interweave. I don’t have a definitive position on this topic, but do not believe that the discovery of alien life should upset Christian theology at the core. Thank you for putting up with my stream-of-consciousness style. You should have a go at it, with your thoughts on the topic of alien life as well. But I do believe that people should get over their sense of bashfulness in volunteering their opinions on this topic.